Popular cloud service providers such as Google, Salesforce.com and Workday support REST and OAuth standards to enable enterprise integration. The challenge is coding, configuring and managing multiple applications with their respective cloud service providers. 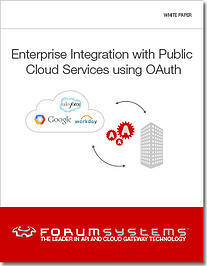 How OAuth standard is commonly used today. The challenges associated with moving your company’s applications to the cloud. How an API gateway can make moving to the cloud easier.